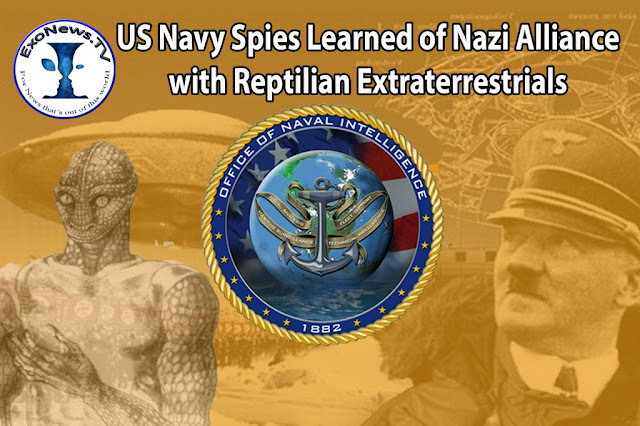 UFO SIGHTINGS DAILY: US Navy Spies Learned of Hitler Alliance with Reptilian Extraterrestrials, Video, UFO Sighting News. US Navy Spies Learned of Hitler Alliance with Reptilian Extraterrestrials, Video, UFO Sighting News. The fact that Hitler had assistance from an alien species is something thats been on all our minds. Obviously some of that assistance was military strategy. The worst thing about this is if Hitler was working with aliens, then he is still alive and will never die due to their technology. If he is still alive, then he can still be hunted down on this planet or another. This reminds me of a Star Trek episode...Storm Front, where the reptilians are helping the Nazis, I'll put a video at the bottom for you to compare it. In today’s episode of Exonews TV, William Tompkins reveals an astonishing secret acquired by U.S. Navy spies embedded within Nazi Germany’s advanced technology projects during the World War II – the Nazi war effort was being assisted by extraterrestrial visitors. The spies had reported to a covert Naval Intelligence operation, located at Naval Air Station San Diego, that Adolf Hitler had signed a secret agreement with representatives of a Reptilian extraterrestrial race. In today’s newly released ExoNews TV interview, Tompkins reveals how “Reptilian consultants” were helping the Nazi SS develop advanced weapons technologies In the interview, Tompkins discusses the Reptilian consultants helping the Nazis: They had, if you want to call them, “consultants”, who are Reptilian consultants assisting on all of these different things that it takes to design and build these spacecraft carriers, and propulsion systems. So this is an extremely well developed program and documented like crazy. Getting copies of the documents was hard for them, hard for our spies. This was an open program in the upper level of the SS.